A large, interesting museum located in the suburb of EUR, the Museo Nazionale delle Arti e Tradizioni Popolari (Folk Art and Traditions Museum) offers insights into the colourful folklore, costumes, lifestyles and customs of Italy. Out of the way, and echoing with emptiness, this museum is a fascinating tour of Italian popular culture over the last few centuries. This is a part of Italy's heritage not to be found in grand galleries, in archaeological museums or on church walls. These halls commemorate the Italy of peasants, carnivals and primitive religious ritual. An Italy where carters deliver wine to Rome in brightly-painted wagons, driving in convoys to deter bandits and where strange-masked dancers perform traditional enactments of the months. Exhibits are wide-ranging, including farming implements, ceramics, ships' sails and even an ornate royal gondola presented to Queen Margaret of Savoy in 1882. There are large collections of traditional costumes and photographs of vanishing scenes and traditions. Among the more bizarre things on show are religious offerings to saints, thanking them for their intervention in times of need: the offerings represent the illness or problem suffered and include primitive paintings of vomiting invalids and wax body parts. 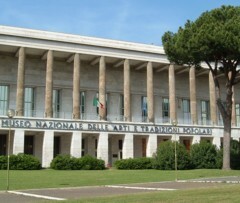 The Museo Nazionale delle Arti e Tradizioni Popolari is in the unusual Rome suburb of EUR, on Piazza Guglielmo Marconi. Opening hours are 9am-6pm.The Metro station Fermi (Linea B) is a short walk from the museum.